January 12th, 2015- Although the economy in Great Britain and France grew in 2014 (data for the last quarter is still provisional), the annual electricity consumption was lower than in 2013 due to weather conditions. The average temperatures in winter 2014 were higher than in 2013, causing, thus, lower energy consumption. Moreover, the registered temperatures in July and August in 2014 in both countries were lower than in 2013, leading to a reduction in electricity consumption. Due to the aforementioned factors, the electricity consumption in France in 2014 was 6.1% lower than in 2013. Similarly, the electricity consumption in Great Britain was 5.0% reduced. Provisional data for the last quarter, point to a positive GDP growth in 2014 in Spain. However, due to weather conditions, the electricity consumption was slightly lower in 2014 than in 2013. The decrease on a year-to-year basis was 1.2%. After having factored in the seasonal and working patterns, the decrease in the electricity consumption in 2014 was 0.2%, according to REE (Red Eléctrica de España). In Italy, a negative GDP growth is expected, according to provisional data for the last quarter of 2014. Moreover, the temperatures in winter 2014 were significantly higher than in winter 2013, leading, thus, to lower electricity consumption. For example, the average temperature in February 2014 was 4.3°C higher than in February 2013. The decrease of the annual electricity consumption was 2.5%. 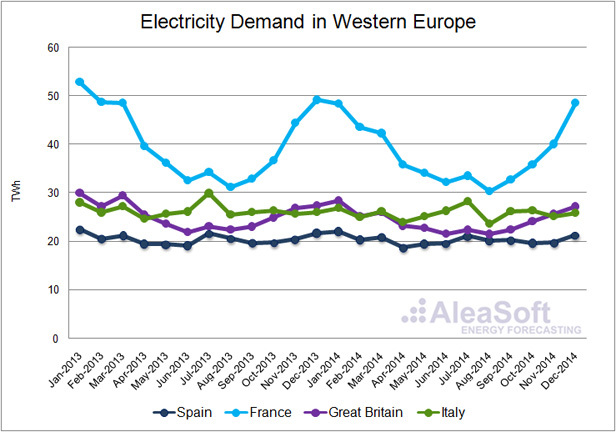 Evolution of the monthly electricity demand in Western Europe -2013 and 2014- (TWh). Sources: France: RTE, Great Britain: National Grid, Italy: TERNA, Spain: REE. In 2015, it is expected a growth in economic activity for the countries of Western Europe. 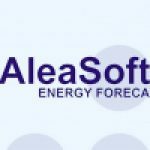 For that reason, the forecasted annual electricity consumption for 2015 obtained using AleaSoft models is higher than the one recorded in 2014 for all four previously analyzed countries. In France, it is expected that the electricity consumption will be higher in 2015 than in 2014, assuming an annual GDP growth of 1.0%. The forecasted electricity demand in 2015 in the Great Britain is higher than the registered one in 2014. The result is obtained taking into account a GDP growth of 2.7%. The electricity demand in Spain is expected to grow in 2015, using a scenario with an annual GDP growth of 1.65%. Finally, the annual electricity consumption in Italy is expected to slightly increase although much less than the other three countries. In the case of Italy, a scenario with a GDP growth of 0.2% has been used.